Still can’t get past that door in Ahnonay, in every Ahnonay. What I don’t get is Kadish claimed that Ahnonay was the home-world. I mean the name means “Water Root”, but how did he pull this off? I’m sure someone must have known that the D’ni home-world was Garternay. Let us see what answers can be found, but for now back to Er’Cana I want to tinker with those ovens again to see if I can create the proper pellet. I loath this place, chills me to the bone, I hate to think what the D’ni prison ages were like. My experiments with the pellets failed, I honestly have no idea what I’m doing. So I’ve returned to Ahnonay in a bid to see what I can do, I know I really should finish looking through the words of the Watcher but I can’t be bothered right now. Made it into Sphere 4 of Ahnonay, had to get into the hut of Sphere 1 turn the current off, swim to the maintenance room, use the shell cloth Link to Relto, Link to the Cathedral, then to Sphere 2 then to the Cathedral, then to Sphere 3, then to the Cathedral, then Link from the Cathedral to Relto then and then Link to Ahnonay using the shell book mark. Found a lovely D’ni jacket. Sphere 4 is unfinished, a giant statue sits in the middle, guessing its old Kadish himself, wonder what it would have looked liked if finished. A chair led me into a pod like machine that took me out of the sphere and actually into Ahnonay proper. There was a control panel with symbols on that matched the ones in the Cathedral, so I entered them in the order they should have been in and a door opened to a laboratory. Linked to Er’Cana, reminds me of the cleft. Found a strange square symbol like the one I found on the imager in the Watcher’s Room, I took a KI image dare say its important. I think after this I shall check out some of the older ages in my possession. I saw a giant petroglyph of the Fissure, I touched it now I’m in a Bahro cave, except it’s different to the last. There’s a pool of water in the center of the cave and some more numbers, 5:18, plus some strange symbols that looks like the volcano in New Mexico. I think I need to get a KI shot of them, this is not making any sense, less sense than when I started the journey. This path very few have trodden I have no-one to turn to for help. A search of the Ages revealed nothing new, except at The Cleft where I discovered a pair of D’ni goggles I had overlooked last time I was there. Very pleased I found these, they will come in most handy. Returned to Er’Cana. Managed to get this strange tram device to work and take me inside the ‘factory’ as I’m currently calling it. What do these numbers mean? Times? Or perhaps book passages, the word? I think I’m in D’ni but where? Not sure, I see the familiar glow of the orange lake out of a window. I have no idea what I’m doing here. Why a Bahro cave with glyphs on the wall that represent power levels in Er’Cana? I wondered if perhaps the number of spikes around the glyphs are the key to what the power levels should be set as. I shall have to wait for the timer to run out then try again. It kind of worked, I managed to get to these pellet things, the problem is I don’t know where to take them, the Bahro cave or the place in D’ni? I took one to D’ni put it in the machine, it scanned it then dropped it into the water below, the water began glowing white. Seems my theory about the numbers was correct, I shall investigate further. One thing still bothering me though is those darn pellets. Perhaps you need to deliver 5 cells to each location, tedious linking back and forth. It is okay from the D’ni location as there is a linking book there back to Er’Cana, but I have to go via Relto every-time I link from the Bahro cave to Er’Cana. What is going on here? Figured out the Quabs (Discovered references to the crab creatures in some documents I liberated from the DRC, apparently the official name for them is Quabs) were what the clock thing was showing so I chucked them all into the water, the lights went out. Linked out and linked back to find destruction, the age is in ruins, gray skies dark and stormy, trees of crystal. Destroyed the trees, I had to the clock was showing them lit up. I had no idea such ages were possible, of course its possible the Great Tree makes it so. Beautiful, a ruptured Ahnonay floating in space. Things are coming together, three instances of Ahnonay. I follow the shells to link to places that I can’t get to in one instance but can in another. Its like the Truman show, what was Kadish doing? I recieved a whole pile of books today. 1 Linking Book, the others were “Words”, a set of books writing by a D’ni Seer called The Watcher. I have read about him in the various DRC journals on the D’ni Kings, he wrote a series of books which more or less amounted to a series of prophecies. I’ve spent the morning reading over them, pretty interesting. 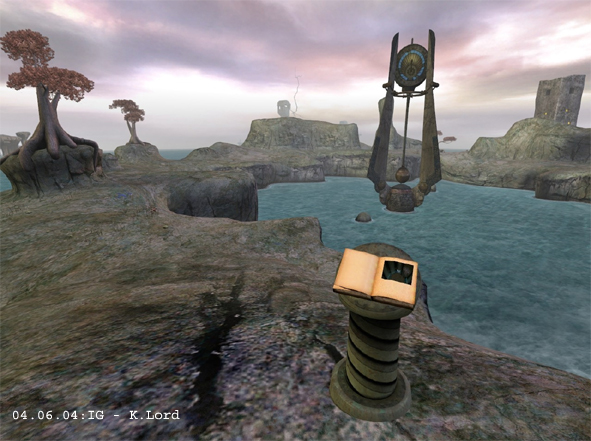 The Linking Book lead to a new location, a round hall like room with an imager in the center, upon the imager is a symbol I have seen in James’ journal, it is the same symbol I know I have seen before.. The hologram of Yeesha forms the symbol during her speech, I can’t believe it took me until now to figure that out. I must be loosing my edge. A stair well leads up to a balcony above. The canvas sheets over the various doorways indicate that the DRC have been here. I don’t believe it! The Great Tree! I’ve seen photos of this place, have waited to explore this area and now I am here, now if I can just figure out how to get there. Given the Great Tree, and the fact that there is one of Sharpers Great Tree jackets here, it’s pretty safe to assume this is the Great Tree Pub he was after. I was right, DRC have one of their notebooks here, one of Simpson’s research books. This place was built long ago for The Watcher apparently. 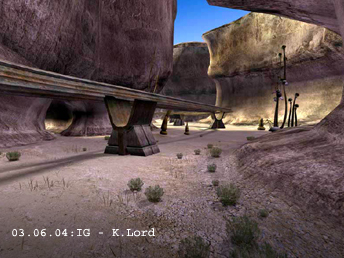 Kadish took ownership of it, started restructuring the place, believed he was the “Grower” that The Watcher spoke of. Apparently this place is in the J’taeri district of D’ni. Inside the alcove with the notebook is a couple of Linking Books, will check those out in a bit, first I want to explore the second level. Balcony is straightforward, there is an alcove that leads to another room, within this room the walls are engraved with strange markings, almost like calibration settings. The one wall shows an odd looking clock, next to it a small metal plate is set in the ground under a lamp. 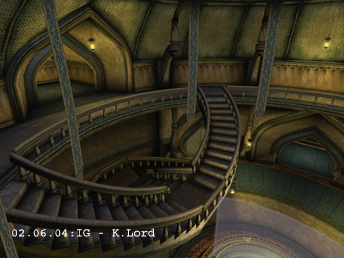 There is a ramp that curves up and around leading to a giant metal sphere engraved with the symbol of The Watcher. I assume this is the puzzle game Simpson mentioned. I think I’ll take a look at those Linking Books. The one to the right of the notebook lead me to an enclosed building, lined with metal and familiar stained glass windows that are also in the Kadish Gallery. At the other end of the corridor like building was another Linking book which lead me to an Age I had seen long ago before the cavern opened from some DRC documentation I stumbled upon but wasn’t supposed to see, this Age was Ahnonay. Strange Age, filled with funny little crab creatures running around, they seem to run from me when I approach them. I have discovered some Journey Cloths, except unlike the ones which have the spiral hand symbol on them, these have the shell symbol upon them. There is an island I need to get to, looks like I’m gonna have to swim, maybe a change of clothes would be wise. More and more explorers have been sneaking back down into the Cavern, one of them, Max, has deemed the group D’ni Raiders. They are organizing themselves, sending out “Raider Reports” to interested parties. Up until now we (The Third Path) have been watching from the shadows, keeping ourselves to ourselves, but this D’ni Raider concept interests me and so I have joined up with them. If this group continues to grow perhaps we’ll have a population down here again, one can hope at least, sometimes the quiet in the cavern is unnerving. But until then, D’ni Raiders we are. I could tell something was amiss when I stepped into the hut on Relto, but it took me a moment or two to figure out what it was. Then I noticed it, a greenish leather bound journal sitting upon the shelf next to the “Journey Ages” journal. I wondered over and picked it up, Yeesha’s familiar monogram embossed on the cover and below it a rustic looking version of the DRC logo. There were some who came here thinking they could build the tree. But only a dead tree is built. Life cannot be assembled from remains. And now these builders are gone. What has happened to them? Are they now part of the remains or have they become part of the tree? For the tree does grow, the great cavern breathes, voices in places in the great void. The called continue their journey here. Building or growing it is their choice. open up a glimpse of the future. As I sat reading over the words again and again, trying to make sense of them, I noticed a new Linking Book upon the other shelf. The familiar blue leather with gold decoration down the spine told me it was to one of the D’ni Neighbourhoods. Is this why the new journal was here? Is Yeesha giving us access to the Cavern again? It seems odd given some of us already managed to get back in. No, knowing Yeesha there had to be something more to this. The Linking Book took me through to not just any Neighbourhood but to Bevin, the first Neighbourhood opened to the Authorized Explorers several years ago. I began to explore the immediate area, nothing really stood out to me. Several images rotated through the community imager. I wandered over to the activity imager and was surprised to find Douglas Sharpers name on it, the date of his visit was recent too…he’s still in the cavern? I guess it should come as no surprise, the explorers returned so why wouldn’t others…perhaps DRC members. I decided to head to the Baron’s Office, hoping Douglas would be there. If no one else is aware of his return then I could perhaps get chance to speak to him without interruption. Sadly he was no where to be seen. Old habit die hard I guess, I noticed a new journal sat upon his desk and so decided to read through it. He mentioned talking with the other DRC members and their feelings on the restoration ending. 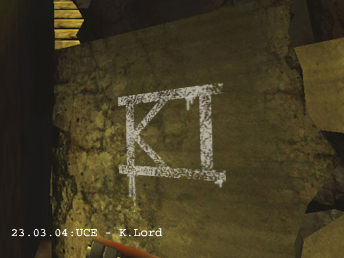 He also listed what appears to be a KI-coordinate sent by Zandi. If only the KI functions weren’t down, if the Great Zero was powered up again I could see where these coordinates lead to. He also mentioned a “Spyroom”… It seems the Book is located in Teledahn near the slave cages. Is this the Book he mentioned in his other journal perhaps? Further reading mentions Kirel has access to the Great Zero..not sure how? But it seems Douglas an I are of similar ideas. We needed to get the Great Zero running and find these coordinates. I ventured into Teledahn, and headed over to the caves. He was correct…if there had been two people here… I managed to open the hidden compartment but in doing so blocked access to it. Fortunately returning to Relto and Linking back to Teledahn via the Journey Cloth granted me access. Within the newly discovered alcove there was a Linking Book to a very small looking room. I placed my hand over the Linking Panel and arrived in a very confined space. A Relto Book sat upon a block of stone…Phil Hendersons I guess? Across from it a Linking Book back to Teledahn. The board in the office had a name on it, Bob O’Goobo. I was half way through the process of trying to remember a DRC member with that name then I recalled something Sharper mentioned in his journal. It’s was a combination code. The Light Garden in the neighbourhoods have orange, green, and blue firemarbles in them. That theory was going to have to wait as I decided I wanted to visit Phil’s Relto. I missed him, I used to enjoy talking to him when he was around. Phil’s Relto was not like mine, not like any of the others I had seen. His was a state of twilight with blue and purple skies, it was beautiful really. I walked up into the hut and was astounded by how many Linking Books he had acquired. It should be no surprise really given his work with both Yeesha and the DRC. All of the Books were locked but one was not, a green bound book with gold decoration down the spine. A neighbourhood Book but not like any neighbourhood I had seen previously. The neighbourhood in question was Kirel, the DRC neighbourhood. I am familiar with this place of course, it is where the DRC took Phil after they kidnapped him and where Tink was brought by the DRC to see that Phil was ok.
Bob O’Goobo, I realized that it wouldn’t be a code for Bevin, why would it? No it would be a code for Kirel as it was written on the board in the DRC offices. Inputting the combination on the Light Garden buttons unlocked the Kirel Prayer Rooms. Inside I discovered that in each prayer chamber there were Bahro Stones Linking to various locations in D’ni. The Bahro Stones lead to several locations in Ae’gura; the library, Tokotah alley way and so forth. My interest however lay with the Bahro Stone that lead to the Great Zero Antechamber as that was the only access point I could not reacquire after the DRC shut everything down. I arrived in the antechamber and placed my hand in the KI slot, the familiar change in the KI interface instructed me in what needed to be done. I would need to work my way through the Cavern collecting Great Zero markers to calibrate the Great Zero. I spent most of the day slowly working my way through the city, Bevin, and Kirel registering the markers needed. Once the KI notified me that I have registered all the markers I needed I returned to the antechamber to upload the results to the Great Zero interface. With the preliminary calibration completed the Nexus allowed access to the Great Zero courtyard. I always liked the courtyard with the architecture and vast map of the D’ni cavern upon the floor. The final calibration machines were at the back of the courtyard, four in total each covering a specific section of the calibration. The machine sadly only allows for one section to be calibrated at a time, which is rather laborious but was needed if I was to find the coordinates that Zandi left. It took me another two hours calibrating those final 4 machines. My memory from previously calibrating the machine was somewhat foggy resulting in my going to the wrong locations several times. The machine churned to life, sparks of lightning arching out across the courtyard and the familiar blue beam casting itself out into the cavern once again. I never get tired of watching that machine do its thing. I headed back to the Ferry Terminal, following the KI coordinates as I went where it lead me to the collapsed end of the Tokotah Alley way. But I could not see anything there. As I was looking through the rubble, thinking perhaps Zandi had hidden something there, the blue beam of the Great Zero swept over the area and in front of me a most curious thing, a shape started to form. But not just any shape one I had seen before from Yeesha after I had finished her journey and in James Rofen’s journal…the shell symbol. As I approached it the familiar sensation of the Linking process took hold. Moments later I found myself in a room carved of rock. A small cot sat in the middle of the room with a book next to it. The journal belonged to Dr. Watson himself…a chronicle of his thoughts after Phil’s disappearance. They all believe he died…No body, only a smashed KI? I’ve said it before and I’ll keep saying it, he is still alive…with the Bahro I bet. Poor Watson though, he raises good points we should have trusted the DRC more than we did. So from reading his journal Watson has come to the realization that many of us in the explorer community reached long ago. He has decided to take the Journey and see what Yeesha has to show us. Better late than never I guess. Is this what you wanted to show us Zandi? To give us closure on what happened to the DRC, to Watson? To show that Watson has had a change of heart? Not just Watson from what Douglas had written in his journal. But I have already taken that leap, I took it the moment I came to the Cleft.